One night, Yoshimine Nitta, who was escaping from pursuers sent by his enemy, and his lover, Utena, visited the house of Tonbee, a ferryman, for a one night stay. Tonbee had betrayed the Nitta family, which he used to serve, and killed one of Yoshimine’s older brother,Yoshioki. Now Tonbee saw his chance to kill the younger brother, Yoshimine, and to get the credit for it. Despite Tonbee’s scheme, his daughter, Ofune, fell in love with Yoshimine at first sight. She betrayed her father and let Yoshimine and Utena get away in order to protect the one she loved. Then she was killed by her father,Tonbee, for Yoshimine. Before dying, Ofune used her last strength and beat a drum, which is the sign to lift a siege, to let Yoshimine and Utena escape. 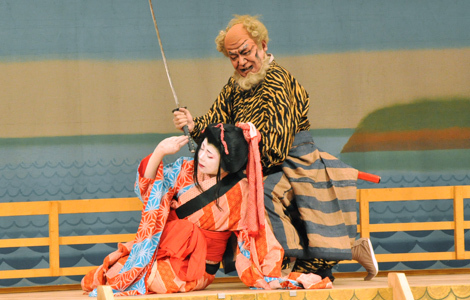 The highlights are the “Ningyo-buri” of Ofune (the actor playing Ofune acts like a puppet) and Tonbee’s “Kumode Takoashi no Hikkomi” (special technique by the actor playing Tonbee to move forward by moving his hands like a spider and his legs like an octopus, which expresses an old man who is in a hurry, but whose body does not move as fast as he wants it to), among others. A ferryman of the Yaguchi ferry. A diabolical person. The younger brother of Yoshioki Nitta, who was killed by Tonbee. A very handsome young man. Yoshimine’s lover (Keisei is a high-ranking courtesan). One of Tonbee’s employees who stops Ofune from helping Yoshimine run away. Gennai Hiraga, who was known as an inventor, wrote many plays for Bunraku (puppet theater) under the penname Kigai Fukuchi. This is considered to be one of his best plays.